Indore Traffic Police Fine: Madhya Pradesh (Indore Traffic Police) is the country's second-largest police system. Each State Police has different rules and regulations. Indore Traffic Police supports the invoicing system to keep the traffic in control. The Traffic Police department has issued orders for strict action against who break the rules of the road. If you have an invoice, you can make payment to Indore Traffic Police E- Challan official website. According to recent Indore Traffic Police orders by the State Traffic Department of Madhya Pradesh, talking on the phone while driving is a punishable offense and the driver will be fined with Rs 100 when caught for the first time and Rs 300 for the second time. Over Speed Challan Price: Rs. 400 for first offence Rs. 1,000 for the second or subsequent offence. Red Light Jump Challan Price: Rs. 100 for first offence Rs. 300 for the second or subsequent offence. Mobile Phone Use Challan Price: Rs. 100 for first offence Rs. 300 for the second or subsequent offence. Drunk & Driving Challan Price: 6 months or Rs. 2,000 for first offence or both. 2 Years or Rs. 3000 for second or subsequent offence committed within 3 years of previous commission or both. Without Seat-belt Challan Price: Rs. 100 for first offence Rs. 300 for the second or subsequent offence. Without Helmet Challan Price: Rs. 100 for first offence Rs. 300 for the second or subsequent offence. Overloading Challan Price: Minimum Rs. 2,000 and additional Rs. 1,000 per ton of excess load together with charges for off-loading the excess load. Without Number Plate Challan Rate: Rs. 100 for first offence Rs. 300 for the second or subsequent offence. Without insurance Vehicle Challan Price: Rs. 100 for first offence Rs. 300 for the second or subsequent offence. 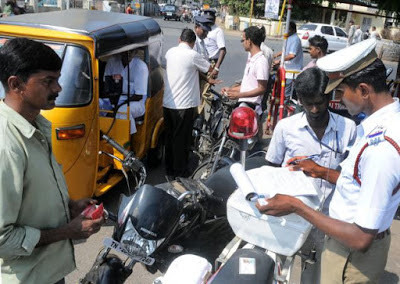 Wrong side Parking Challan list: Rs. 100 for first offence Rs. 300 for the second or subsequent offence. If you have also invoiced, you can now pay it online. In offline method challan counter situated at traffic police station M.T.H. Compound. Challenge driver or vehicle owner can deposit fine at the center from 10 am. - 2 pm and 5 pm - 8 pm. ( Sunday closed). Separate counter for computerized challan ( E-challan) at the same police station. Follow the steps below to pay for online Indore Traffic Police E- Challan Fine. Now Fill the required Challan Details. After filling all detail complete press "Search Button"
In the next webpage, you will see your challan amount now pay it. You will pay online invoices by following the instructions given above.